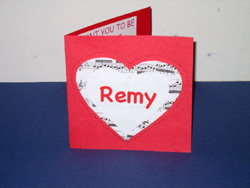 These are wonderful, old fashioned, easy to make valentines. Don’t be put off by the length of the instructions, it’s all pretty straight forward. Decide on the size you want your card, a size that will be determined by the envelope you are planning to use. Mine was approximately 5 and one half inches by five and a quarter inches. If you are without an appropriate envelope, make one as shown. Make a template for your heart by folding and cutting a sheet of paper of equal or lesser size than your card as shown in heart chain. With a light pencil mark, draw around this template on the front of your card. Using a larger than regular sized needle, a well sharpened pencil or a ballpoint pen, carefully poke holes as closely together as possible around the penciled line. Both the pen and pencil are going to make marks. If you’ve got a needle, use it, but be careful about pricked fingers. From there you can let your creativity go, adding hearts within hearts of different sizes and patterns. 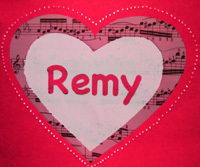 To make the Remy heart, I typed his name into the computer, printed it on computer paper, then used a heart template BEHIND the letters to center them on the heart. Once centered to my satisfaction, I drew around the heart image that was showing through from underneath and cut it out. Finally I pasted it all together. A younger child could simply write the messages on the hearts with colored pencils or markers, or make different colored hearts with no message. Adapt the idea to your child’s skills. INSIDE: My grandchildren enjoy using the different fonts and colors available on the computer. 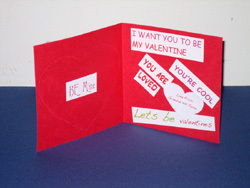 Let them make up their own messages, type them into the computer, print them, cut them out and paste them inside their cards. MATERIALS NEEDED Computer, printer, construction paper, scissors, glue, markers, crayons, pencils, Either a ball point pen, a large size needle, or a well sharpened pencil. SKILLS NEEDED Simple computer skills. ability to cut and paste. manual dexterity enough to poke holes along an established line.